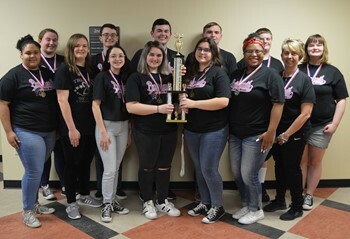 Normally Portsmouth’s colors are red and blue, but the Portsmouth High School Academic Competition team was all pink for its Division II victory on March 14, in honor of their late Coach Amy Keating who passed away of breast cancer in February. Sixteen area school districts competed in the Southern Ohio Academic Competition Tournament at Shawnee State University, in Portsmouth, Ohio, on March 14, 2019. Division I included Wheelersburg, Rock Hill, East, Northwest, Valley, New Boston, West, and Notre Dame. Division II included: Portsmouth, Piketon, South Webster, Green, Minford, CTC, Oak Hill, and Clay. Wheelersburg won Division I Championship with Coach Brian Oakes, and Rock Hill won Division I Runners-Up, with Coach Tamela Reed. Portsmouth won Division II Championship, with Coach Julie Horn, and Minford won Division II Runners-Up, with Coach Brett Oakes. Portsmouth’s team wore black and pink breast cancer shirts in memory of their late coach Amy Keating, who passed away during the season. “Coach Keating had such a positive impact on everyone she coached whether it be tennis, quiz bowl, mock trial or track. She will be missed immensely not only as a coach but as a teacher, mentor, co-worker and friend,” said Portsmouth Coach Julie Horn. She said the team dedicated their victory to the memory of Coach Keating. “No words really needed to be spoken, but we all knew that was an especially meaningful victory for the PHS Quiz Bowl team. It brought lots of smiles and lots of tears and we all knew Coach Keating had a smile on her face,” Horn said. Portsmouth and Wheelersburg high schools will now advance to the 35th annual OAC Regional Competition in Lancaster, Ohio, on April 6, at the Ohio University Lancaster Campus. Teams that win at Regional Competition will advance to the State Competition in Columbus on May 11, at St. Charles Preparatory School. The Southern Ohio Academic Tournament is organized by the South Central Ohio ESC, in New Boston, Ohio. For more information about the ESC, visit online at www.scoesc.org, or follow on Facebook, YouTube, and Twitter.